Joris van Gool is a young ambitious athlete who has set himself the goal of competing on behalf of the Netherlands at the Olympic Games 2020 in Tokyo. Since his participation in the EYOF (European Youth Olympic Festival) 2013 in the Netherlands, July 24, 2020 (opening of the Games in Tokyo) has been marked in bold in his agenda and every day is dedicated to athletics, the mother of all sports. As an eight year old, Joris went to take a look at the local athletics club AV Spiridon. After a number of trial classes, he became a member of the association, not knowing that athletics would dominate his entire life. For Joris, athletics was, in the first instance, just a hobby. He enjoyed training, but he didn’t want to think about competitions. It was his coach, Jeroen Farla, who convinced him to take part in a competition. It did not stop at this one match. In 2011, Joris was invited by Marjan Olyslager to participate in the regional training hurdles in Rotterdam. He also joined the sprint group of Coen Huijding in Tilburg. Together they worked, in very good consultation, on the development of Joris as an athlete. Both on the hurdles and the flat sprint Joris continued to develop until the moment arrived, when the hurdles too often caused injuries. Joris decided to focus on the flat sprint. In 2016 Joris goes to Papendal and Rogier Ummels becomes his coach. 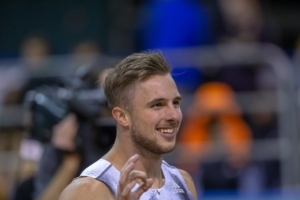 With Rogier Joris qualifies for the European Indoor Championships in Glasgow. He wins, in a PB of 6.62 seconds, a historic bronze medal for the Netherlands. A bronze medal was won with the relay team. Joris started participating in National Championships as a junior. He did not do this without success. As a junior he became multiple Dutch Champion at 110 meter hurdles and the 100 meter sprint. As a junior he also knew more than once to become Dutch champion at the all-around camp. Joris became senior in 2018. As a freshman, he immediately won a bronze medal both indoors and outdoors. In 2019 he became Dutch Indoor Champion in the 60 meter sprint. In 2014 Joris has a tattoo placed on his right lower leg. 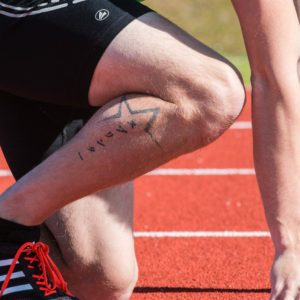 This tattoo symbolizes his story, his passion for athletics, his specialty and his goal. In one Japanese word he wants to say that he is a sprinter who has set himself the goal of competing for the Netherlands at the 2020 Olympic Games in Tokyo. The Japanese word ス プ リ ン タ ー that is tattooed on his calf means sprinter. The star stands for having a goal, or reaching for the stars. Without a goal, it is almost impossible to have the motivation to keep going. The star also represents the road that must be traveled to reach the top. 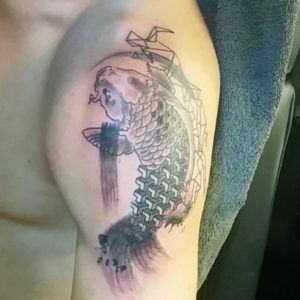 The tattoo, a koi with a sprinter on it, which Joris had placed on his upper arm, is again a meaningful tattoo. It symbolizes Joris’ determination to reach the top and the Japanese story behind the image of the Koi is also a nod to the Olympic Games in Tokyo. The origin of the meanings around the koi carp comes from China. There is a legend where the fish swam against the stream of the 5464 km long Huanghe, the Yellow River, to reach the Dragon Gate. When they succeeded, they turned into dragons. The Japanese have partly taken over this story, only to tell them that the fish were climbing waterfalls. In both the Chinese and Japanese traditions, koi fish are known for swimming against the current. In Japanese culture, this is seen as absolute power, because the Koi keep swimming upstream without being distracted or discouraged by anything. The line work on the right side of the Koi develops upwards in a sprinter on the way to the top. This line work was created from a photo by Joris. 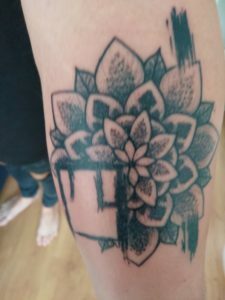 His family is one of the sources of inspiration for his latest tattoo. Mandalas are also meditation objects that support the concentration in order to reach the goal. We know Joris’s goal, so this tattoo can only help!